For three years, the members of Utah Paranormal Exploration and Research (UPER) have been involved in a joint project with the owners of Dead Haven, an Ogden, Utah, haunted house formerly known as The Dark Domain. UPER approached The Dark Domain in October of 2001 with a theory and a goal. The theory: that energy generated from strong emotional responses -- such as fright -- can attract or even generate paranormal activity, and likewise, that with the absence of such an energy source, activity will decrease. results so far have been fascinating. UPER decided to utilize a commercial haunted house for a couple of reasons. First, we wanted a location capable of generating intense levels of fear, which the staff and owners of Dead Haven readily provided. Second, we were looking for a place with an extended period of human inactivity -- a place with plenty of...dead time...if you will. The off-season of a haunted house certainly provides that. Then there was the initial interview with the owners, cast and crew and during the space of the interview we found that they had witnessed paranormal activity over the course of the season.So with our parameters in place, the investigation began. 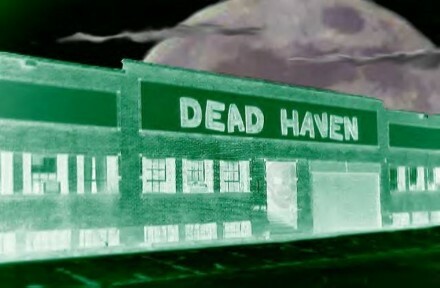 Dead Haven had already been open 5 weeks when UPER moved in on Halloween Night, 2001, to began recording. Paranormal activity was abundant. UPER caught a significant amount of orbs and what is normally called squiggles (corkscrew shaped anomalies) and what fascinated us was the fact they were appearing to go right through the walls and on one piece of footage there is a small flash of light on a wall and then a squiggly comes right through the wall and flash of light. The walls were searched to make sure there were no cracks or openings and indeed they were solid. With the seasons closure, however, paranormal activity within Dead Haven began to wane during the first part of November activity had decreased and stayed at that level into January, were there was a small spike. UPER held an open investigation in mid January and the introduction of new people and new energy seemed to awaken something. Along with orbs and some EVP people felt something touching them on their shoulders or tops of their heads. By summer of 2002, activity was erratic at best, with no sightings recorded at all on some nights. The loud bangs often associated with haunted places, and evident within Dead Haven in the weeks immediately following Halloween, ceased as well. Then in July some people were brought through that worked with one of the owners and a few small scares were in place as they meandered through the building and once again there was a spike in activity. A shadow was seen moving through the graveyard as well as orbs, squiggles and unexplained noises. As that time of ghosts and goblins approaches once more, paranormal activity at Dead Haven is again on the rise. A man has been seen walking behind Jason one of the owners, also a human shadow moving across the wall in the basement, a woman moaning and movement and sounds coming from rooms where there is no one. Is this because human activity has increased as the owners and staff prepare for the upcoming season? Or are there other factors involved? Utah Paranormal Exploration and Research may never know what causes orbs, EVP, and things that go bump in the night, yet our team remains dedicated to the gathering of information in this field, adding its data to the professional cauldron already in place. If a journey into any world begins with a single step, then perhaps these efforts will one day be our contribution to a deeper understanding of the paranormal. and staff for allowing us access to their building not to mention their assistance and patience as we've conducted our research, sometimes into the wee hours of the morning. During the 2002 and 2003 Halloween season, UPER will continue its study of paranormal activity at Dead Haven, and will be doing filming and recording and also be available from time to time to answer questions. Paranormal. As a result of our work we have been able to better identify what is dust and debris and what constitutes a true orb, we have also been able to establish patterns in air flow as a person walks through an area and how long the displacement of the air affects floating particles. Also the effects of weather on investigations. UPER has also documented the effect of people in a state of heightened fear and how that affects paranormal activity. UPER has been privileged to experience several wonderful cases of unexplained or strange occurrences. It would be presumptuous of UPER to classify the occurrences as "True Paranormal" events as the field of study is so wide and diverse, however UPER has gained insight from these events and it has better prepared us for what lies ahead.